Today September 5th is a holiday little know about but if they did they would want to celebrate each and every day. It is a holiday simply titled "Just Because". You can do anything you want to do or nothing at all today "Just because" it is your day to decide what you want to do. So, today I decided to share with you one of our favorite ways to decorate the house with vintage goodies that others may not think much about but it is simply using what used to be and decorate the house for now. Using an old window frame, some chicken wire, paint, stencil and blackboard chalk for small frames and you have a unique wall piece. Preheat oven to 375F/190C. Spray silicone muffin pans or individual silicone baking cups with nonstick spray. (You can also use 2 paper muffin liners sprayed with non-stick spray but the silicone pan or muffin cups work much better.) In each muffin cup put a very generous pinch of grated cheese. The muffin cup should be about 2/3 full of cheese before you put the egg in. Break eggs into bowl, add milk or half and half if using, and beat until egg whites and yolks are well combined. Add spices and green chiles with juice and mix into eggs. 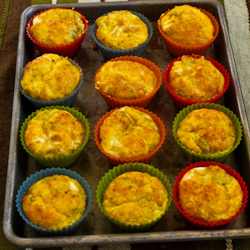 Pour egg mixture over cheese so each muffin cup liner is full to the brim. (This usually takes two pourings as the egg mixture settles over the cheese. Be sure they are as full as you can get them, but not running over the side.) I like to take a fork and gently "stir" in each muffin cup to get the cheese evenly distributed in the egg. September 4th holds the food holiday which may be the sweetest of all. For those with a sweet tooth or simply love dessert this is the day for you. The date September 4th has been deemed eat an extra dessert day. No one knows quite where it comes from only that many are glad that it did originate. So whether you are an ice cream type of person, someone who loves the goodness of a cake or cookie or the pie lover have a second piece on us. No guilt after all it is a holiday that others have observed. 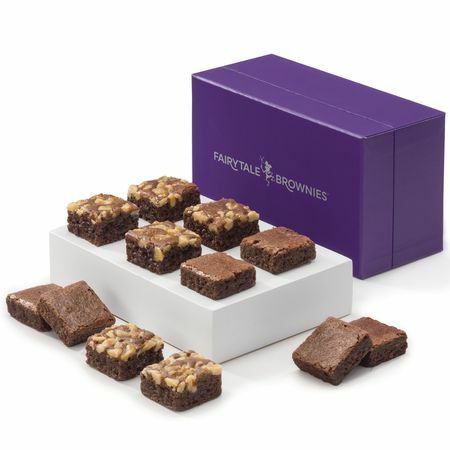 Fairytale brownies, a taste of pure enchantment. I believe they live up to their name. While I have enjoyed snacking on fairytale brownies before, I was delighted to see that they had a sugar free variety as well. Oh my goodness, I could stay on my diet and enjoy the delicious brownies as well. That to me is very enchanting. The company Fairytale Brownies began with a sweet friendship way back in kindergarten and a promise in high school. In the fall of 1992 the duo were baking late at night in a friend's catering kitchen. They were armed with lots of helpers and a secret family recipe. That is when their dream came true. The same ingredients used in the kitchen that day are the same ones that are used in the brownies today. Start with dark callebaut Belgian chocolate, premium creamery butter, farm fresh eggs, fluffy cake flour and don't forget the secret ingredient a dash of magic. In the Fairytale Brownie kitchen they cook up cookies and buttery bars as well with both made with premium ingredients. There are never any preservatives or hydrogenated oils. Whether you will eat them alone, share with a friend or give as a gift you can rest assured that Fairytale brownies will be delightful. Count on freshness, unsurpassed taste and an unconditional guarantee. The fairytale brownies experience to be taste of pure enchantment. We were able to review the simply delicious fairytale brownies. They came in a pack of 12 and were magically delicious. I found these delicious enough to share with friends and most likely will be on our Christmas List to give as gifts as well. The same chocolate goodness that is regular brownies was found in the sugar free The nutritional value lets you enjoy an entire sugar free version for 200 calories and less than 30 carbs. We were delighted with them as I am sure you will be as well. 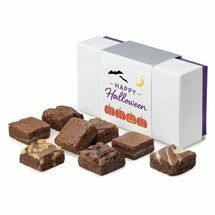 If you are looking for a bit of fall and Halloween in a snack version check out the Fairytale brownie varieties in cute Halloween décor. Fairytale brownies. 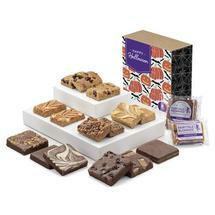 Perfect to snack on, give as gifts, or to share with your guest. Everyone I know loves them you should give them a try. The Treaty of Paris was negotiated between the U.S. and Great Britain in 1783. It ended the revolutionary war and recognized Americas independence. The signers of the treaty were nominated by the Continental Congress and included John Adams, Benjamin Franklin, John Jay, Thomas Jefferson and Henry Laurens. 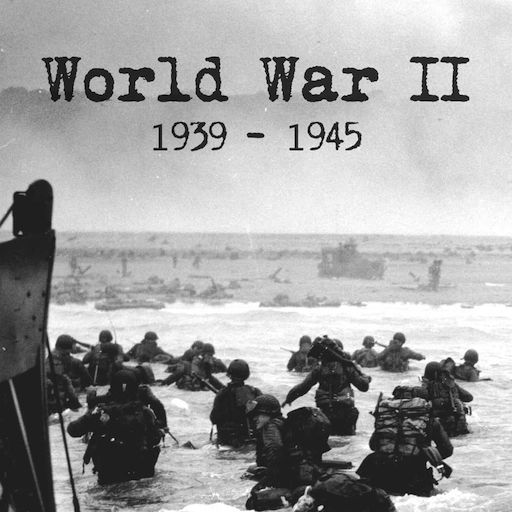 Many say that today September 3rd was the day that WWII started when Britian declared war on Germany. This was after on September 1st Germany had invaded Poland. September 3rd is the day that league bowlers celebrate across the U.S. League bowling was established soon after modern type bowling which was created and organized in New York City in 1895. Leagues of all sorts exist. Those set up of male only, female only, or mixed. There are also leagues for teens and kids. Teams normally consist of 3 to 5 players. League playing is a great way to get out and be social as well as be physically active. Celebrate the day by getting together with you league or your friends and go bowling. Today is food holiday for Welsh Rarebit. A dish with a savory sauce of melted cheese and other ingredients. It is served hot, after being poured over slices of toasted bread. The hot cheese sauce may be served like a fondue. The names originated from 18th century Great Britain. While no one actually knows where the recipe originated there are many stories behind where it could have come from. Some say it is from South Wales where it was a staple of sorts. A generous lump of cheese is placed in a mix of beaten eggs and milk, seasoned with salt and pepper and baked in oven til egg mix is firm and cheese has melted. 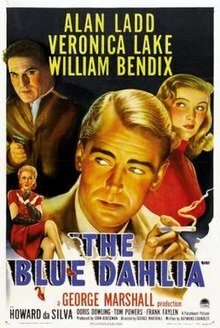 The name itself may have been adopted because it was used by the English to mean "foreign" However, it could have just been named for the welsh after their love for cheese. Rarebit was first recorded in 1785 perhaps as a miss spelling. Legend has it that Welsh Rarebit was created by the peasants as they were not allowed to partake in the rabbit that was so famously hunted. They instead would settle for their bread toasted with a cheese sauce over it. Contradiction, English cookbooks of the 18th century reveal that the dish was luscious supper or a tavern dish. With fine cheddar cheeses and wheat breads. 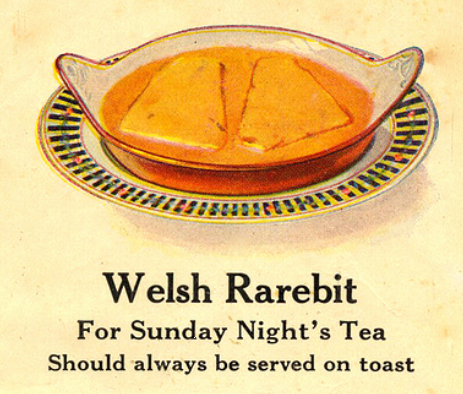 There are variations of the welsh rabbit including English, irish and scotch rabbit but with none of them noted to be rarebit. Combine the cheese, flour, butter, mustard and beer in a pot and melt together over med-low heat, stirring occasionally. Yes, it will end up looking like cheez whiz. When your bread is toasty and your sauce is all meltey and combined, season the sauce with pepper (and salt, if desired). Flip the toasts over so the untoasted side is up. Spoon or pour the cheese sauce over the slices and return to the broiler again. Cook the slices until they have brown spots and are hot and bubbly. 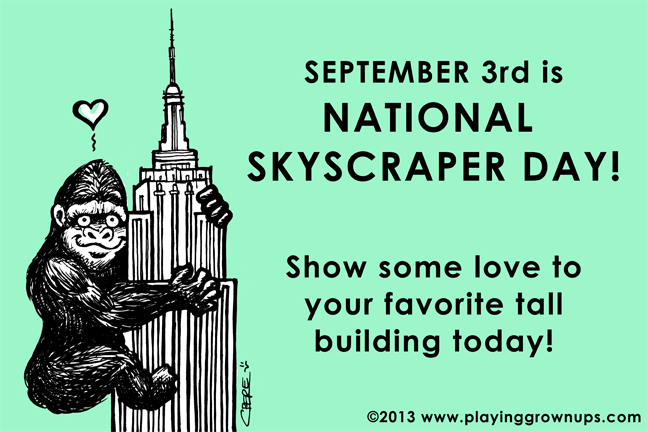 The birthday of architect Louis H. Sullivan, erector of the first skyscraper and aka "father of skyscrapers" would celebrate his birthday today, September 3rd and so we celebrate today as Skyscraper day. The only definition that is given for skyscraper is a very tall building. Let me tell you that as a young girl from a rural community moving to what seemed like a much larger town (now that I have lived here not so big) saw a 10 story building I was astonished and delighted. I loved going down the road and seeing this tall building. I have been to the big city several times now and the large buildings still have that appeal on me, while I am scared of heights I love looking up at them. The world's first skyscraper is generally considered to be in my home state of Illinois. In Chicago in fact it is the Home Insurance Building. Standing 10 feet tall, as impressive to them as it was me. With a frame of metal not the popular stone that was used primarily in the day. In 1890 2 more stories were added to the building. While visually impressive, Skyscrapers can be very economical in large cities where space is a resource and expensive. By going up skyscrapers create a high ratio of space to actual ground area. 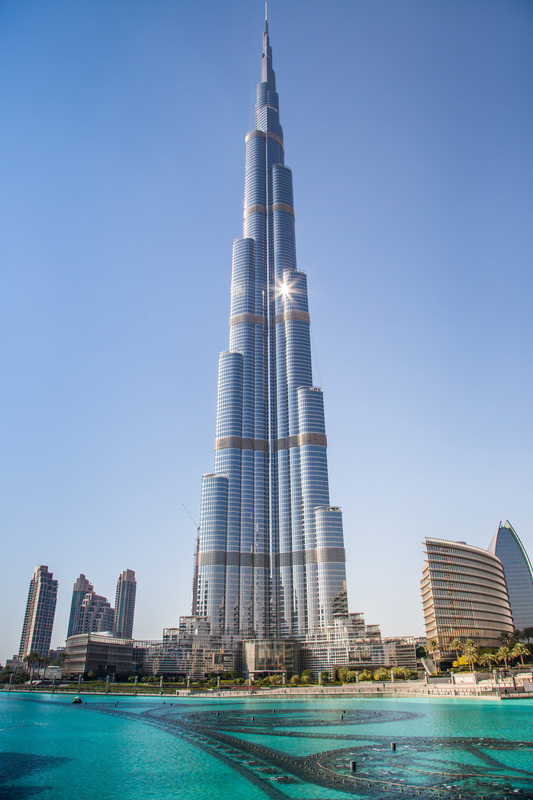 The worlds tallest skyscraper is the burj Khalifa in Dubai, United Arab Emirates. With 163 floors and at 2,717 feet it is truly the tallest. Do you live in a city with tall skyscrapers? Have you been to the very top? Whether we buy lunch or bring a pack lunch to work, due to convenience and lack of thought, what we eat can become rather boring, monotonous and not necessarily stimulate us nutritionally. This could result in our cognitive performance diminishing and we may struggle to get through a long afternoon of meetings/work in the office. Why not try some of the suggestions below to help us stay alert, contribute to our five a day and of course …… help with our digestive health. In a large pot or pressure cooker, sautee a chopped onion in butter (save a few tablespoons of butter for preparing the instant couscous later). Add the meat cuts and brown. Season with salt and pepper to taste and about a tablespoon of tumeric. Cover meat with water (at least a few pints) and put a lid on the pan. Cook until the meat is tender and easily pulls away from the bone. This takes about an hour in a pressure cooker. Add more water as needed. Once the meat is done, add in some vegetables and legumes such as canned chickpeas, fava beans, tomatos, cabbage, carrots, potato or daikon, and squash. Simmer vegetables in broth until tender. Meanwhile, prepare a package of instant couscous according to package directions. This should take about 5-10 minutes. Don’t skimp on the butter. Serve vegetables and meat on a platter over couscous. Enjoy the food and impress your friends and family. 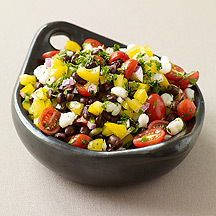 In a medium-size bowl, combine beans, hominy, tomatoes, pepper, onion, cilantro and jalapeno. In a small bowl, whisk together lime juice, honey, oil, cumin and salt; pour over bean mixture and toss well to combine. Yields about 3/4 cup per serving. 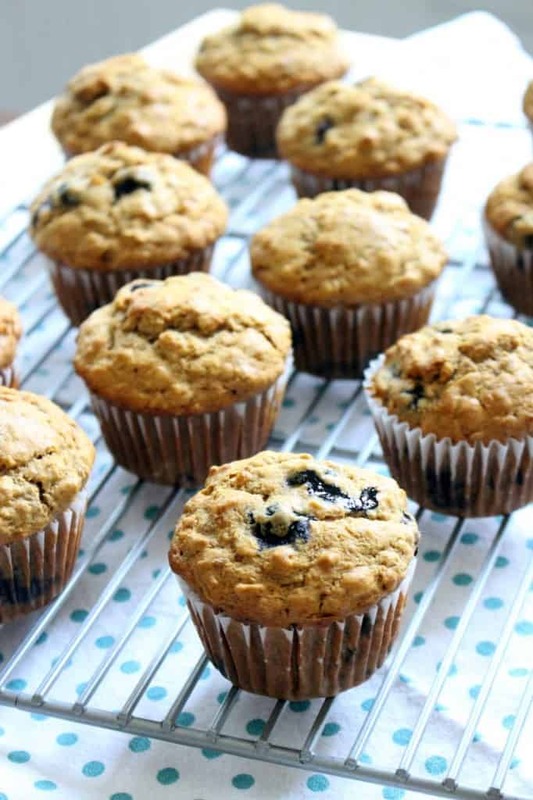 no processed sugar, coconut oil and whole grains makes for a hearty, healthy, and delicious muffin. The whole wheat flour helps increase fiber intake. Banana offers great form of potassium and blueberries are one of the "super food" packed with antioxidants and vitamins. They freeze quick and therefore make an easy breakfast any day or goes nicely in a lunch box. Add coconut oil and honey to large mixing bowl. If coconut oil is solid, microwave for 15-20 seconds, until honey and oil are softened. Add egg and yogurt or sour cream, cream together. Add bananas, vanilla, cinnamon, nutmeg, baking powder, baking soda, and salt, and mix until well combined. Fold berries in to mixture. Line a 12-cup muffin tin with liners; fill with mixture. Bake at 375 for 20-25 minutes, or until toothpick inserted into center comes out clean. MADD recently celebrated its 35th birthday. Mothers Against Drunk Driving (MADD) was founded by a mother whose daughter was killed by a drunk driver. I first heard about MADD my freshmen year of highschool when a teacher thought enough about her students to have a leader come in and talk to us about drinking and driving and drinking under the age. That was more than 20 years ago but the information shared was something I will never forget. MADD recently celebrated their many years by creating a future for NO MORE VICTIMS. The largest nonprofit group working to end drunk driving and help fight drugged driving, support the victims of these crimes and prevent underage drinking. There is no charge for the help that MADD offers. The group serves one person every ten minutes through local MADD victim advocates and at 1-877-MADD HELP. The goal is to eliminate drunk driving through increased law enforcement, all offender ignition interlock laws and advanced vehicle technology. Having lost family members in car wrecks caused by other drivers who were under the influence I am very much aware of the loss that occurs when this happens. I have preached to my own children to never drink and drive and if you ever find your self in a situation where you need a ride all you have to do is call and I will be there to take you home , no questions at that time just a safe ride home. The same goes to my friends I am there if they need help as well. Recently, however when one of my children's friends went out on their own and drove under influence and had a wreck I was proud of my children who told him all about how wrong it was and what I would think. He found out that I did not like it but I was not the worst thing that happened. He faced trials, jury, insurance hike, probation, community service and so much more including a visit with the MADD official in our area. Remember to drive sober or face the consequences. To hear stories of those that have faced nights like the one I did but were not as lucky as our friend you can visit the MADD website. While life may not be perfect. 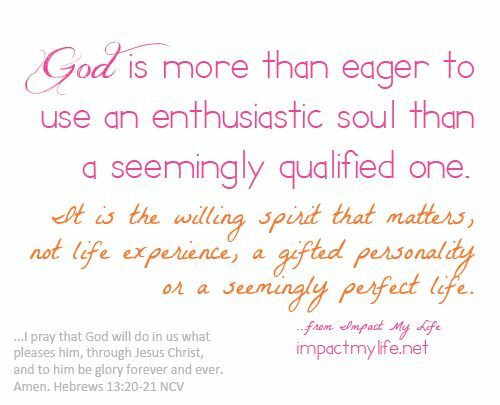 There are a few things that you can try to be more enthusiastic in life in whatever you do. Force yourself to act enthusiastic, and you'll become more enthusiastic."